Are These Hot Dogs Really Natural? During the Summer we spend most long weekends at the beach and every time my family is at the cottage I know exactly what my husband is going to eat for lunch, a hot dog with cheese & jalapenos. Since my son Ben has been around, I have become an avid label reader, and hot dogs really scare me! Over the last couple of years, companies like Schneiders & Maple Leaf have brought out deli meats & hot dogs that they claim to be natural. Now, as a Nutritionist & a Mom, I am very sceptical of this! So, I thought I would investigate further to see if I can convert my family to a healthier version of their favourite ball park dog! Firstly, I did find out that there are no guidelines for using the word natural in a product, so by having ‘natural’ in the name of the product or on the packaging does not mean that it is any healthier, any closer to real food, or have any less impact on the environment. Doesn’t sound too bad, only 9 ingredients and I can pronounce them all. Maple Leaf has a Natural Selections line of products that also include pork hot dogs. 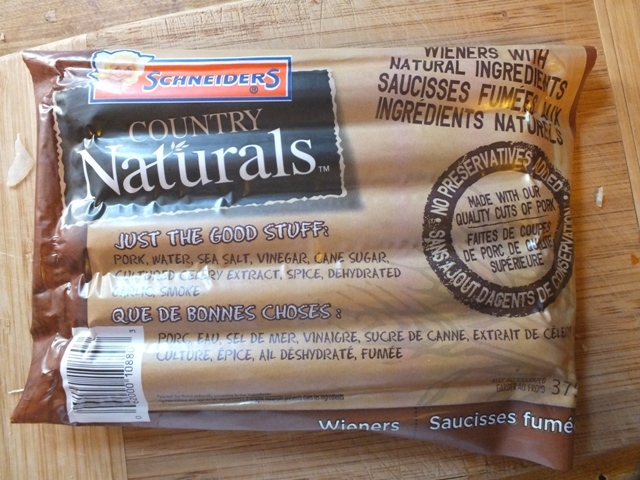 They make similar claims and their product only has 8 ingredients (same as Schneiders but minus the cane sugar). Another company that I have purchased from in the past is Life Choices, they make an all-beef hot dog that contains similar ingredients but they also claim that their animals are vegetable grain fed with no antibiotics or hormones and that they have no fillers or by-products, and are gluten & peanut free. Now, there is one ingredient that is on all 3 products – cultured celery extract. So, what is this? It sounds OK. Well, if it’s from celery it should be right? Cultured celery extract is a natural source of sodium nitrite, this is a naturally occurring mineral and is found in a variety of foods, especially green vegetables (including celery). Sodium nitrite has traditionally been used as a preservative in processed meats and fish. It helps preserve the pink/red colour of the meat, without this, they would all look grey and not very appetizing! Sodium nitrite has been shown to have carcinogenic side effects, which means it can have cancer causing effects. This is why a lot of people are staying away from them, and why companies are now claiming their products to be ‘nitrite free’. Another interesting fact I recently found out is that vitamin C eliminates the negative effects of sodium nitrite. So, next time you are eating one of these ‘natural’ hot dogs, have some peppers, tomatoes, or broccoli with them. Now, I am still not 100% sure about these natural products, but I am not kidding myself, I know that my husband is not going to give up his cottage hot dogs. But, if I can swap his nasty, fake hot dogs for a better choice and tell him to continue to eat them with jalapenos (remember vitamin C!) then maybe I can make both of us happy!